WVI is truly thrilled to have the support of inspirational wildlife photographer and champion of painted wolves, Nicholas Dyer, for our 2018 Big Give #ChristmasChallenge18 campaign. We couldn’t agree more with his plea for painted wolves to be given a place at ‘the top table of conservation’. 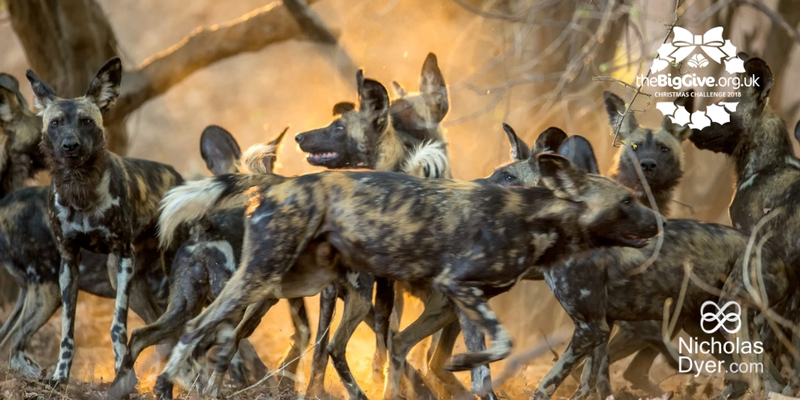 Nick’s captivating pictures and profound passion for painted wolves have recently brought him to the attention of the BBC, National Geographic and talk Radio, as well as earning him a Highly Commended in 2018’s Wildlife Photographer of the Year (WPY) competition, all of which is helping to raise the profile of these incredible but rapidly disappearing animals. 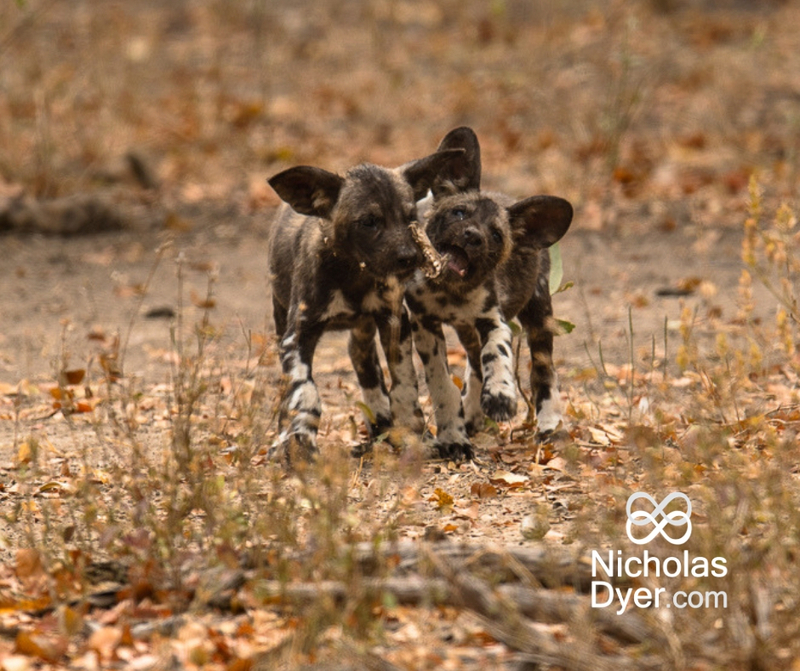 Raised in Kenya and a former fund manager in the City of London, Nick moved to back to Africa in 2012 in order to pursue his passion for photography,only to discover a new obsession; the painted wolf. He spent the next year learning to walk relatively safely in the Mana Pools National Park, the only park in Africa that can be visited on foot. It was here that he came across and fell in love with three packs of painted dogs who roam the basin of the Zambezi River. It was also when he met Peter Blinston of Painted Dog Conservation, WVI’s partner on the ground in Zimbabwe. It quickly became evident that they shared a deep interest in the fate of the painted wolves. A decision to collaborate on a book together saw Nick spend the next five years walking with the packs, gaining their acceptance as a background presence, and unprecedented access to capture images of pack life. In 2015, a BBC team arrived at Mana Pools to film the painted wolves as part of the current Dynasties series. Nick spent much time photographing alongside them for two years as they both discovered new behaviours that had never been documented before. The striking image that earned him Highly Commended in the Wildlife Photographer of the Year competition is of two young painted wolves taking part in an enthusiastic game with the remains of their breakfast – a grinning baboon’s head. Macabre and yet amusing, the enjoyment of the pups is palpable.However it’s much more than just an exceptional photograph. It’s evidence of a scientific first and of how painted wolves are helping an eco-system come back into balance. A recent boom in the baboon population in Mana Falls has had a significant impact on the bird population, as the monkeys are prolific nest-raiders. But now it appears that the painted wolves are opportunistically expanding the prey on their menu from antelopes like impala and kudu to include baboons. Both the bird population and the painted wolves stand to benefit from this subtle rebalancing of nature. Nick is very honest about his fascination with painted wolves. While he is wary of anthropomorphism, he does admit to finding their highly social behaviour endearing. It is, he says, ‘full of play, great social bonding,dancing, social greeting – great fun to watch and photograph.’ He has been particularly struck by the matriarchal nature of pack structure, which he sees as characterized by a nurturing environment based on submission rather than aggression, where the pups eat first and the alpha female last – a pattern highly unusual for larger predators. Nick has a great affinity with the wolves and knows each individual by name, some of which will be shared with a much wider audience when the BBC Dynasties episode airs on 2nd December. Look out for Pip the chief babysitter, Blacktip the legendary alpha female whose pups feature in the WPY photo, and many other memorable characters including two other incredible alpha females, Tammy who is Blacktip's sister, and their incredible mother, Tait. 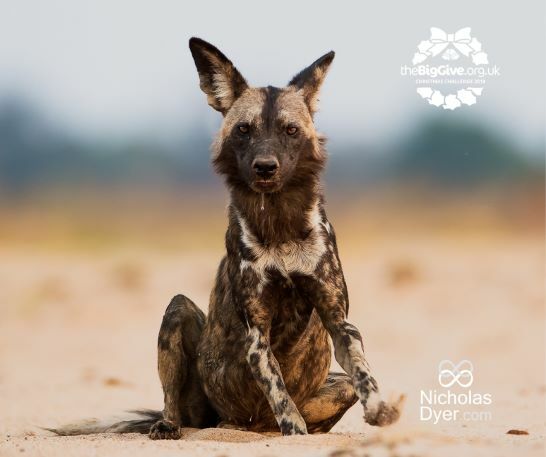 Thank you Nick for all you have done to raise awareness of these unique animals and for supporting our BigGive campaign, which will directly benefit the painted wolves of Zimbabwe, as well as the health of the people who live close by. By working together and taking a holistic approach we can surely convince many more that these unique animals, with their infectious joy for life, deserve a proper chance in the race against extinction. * To find out more about how to get hold of a copy of ‘Painted Wolves; A wild dog’s life’ by Nick Dyer and Peter Blinston, head to the website of the Painted Wolf Foundation. PWF was recently founded by Nick and Peter. *Listen to Nick’s interview with Paul Ross on Talk Radio here. * Hear more about WVI’s collaboration with Peter Blinston and Painted Dog Conservation here.